The South Riding Triathlon is this weekend and I am excited. I consider this to be my premier race for the year, and my measuring stick for my fitness. I did my first SR Tri back in 2011 (I would have done it in 2010, but it was the same weekend as my wedding, so my better half managed to talk me out of it) and have done it every year since then. 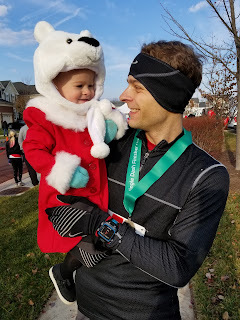 And every year, I have improved my overall time (last year I was slower on the run and bike than I was the year prior to that, but as mentioned in my previous post, I killed it in the transition, so my overall time was lower). Since the Tri is on Sunday, I've been tapering this last week. It's been tough since I've felt so good during all my workouts. I had a 7min/mile 5 mile run, which is the fastest I've done in a long time, and then I rode the bike course and managed to set a personal best. I was really happy with that since it's an open course and I had to stop/slow down at multiple intersections. Which means that when I am in race mode, and have volunteers stopping traffic for me, I should be able to go even faster. The swim is 400 meters and I did a time trial in the middle of one of my swim practices and had a personal best there, as well (don't laugh, but it was 7:10). Last year, my trial time was 7:16, but my actual swim time was 7:24 due to being overly excited at the beginning, and having a slow person in front of me. 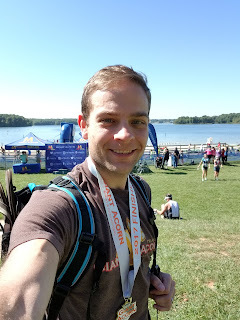 My goals for this race are pretty simple: personal best in swimming (7ish minutes); top 20 in biking (sub 33 minutes for the 12ish miles); top 3 for the run (sub 18 minutes); sub 2 minutes for combined T1/T2. Overall, I'd like to be sub 60 minutes which puts me 5th overall from last year's standings and 2nd in my age group. Obviously, I can't do much to control other people's times, so I I'll just have to focus on my own. If I manage to hit those numbers, it will be a 4+ minute improvement over last year. It's doable, and I'm excited to do it. Who needs a training plan?